Summer season = lot's of movies released, and one of the movies that I am looking forward to is Despicable Me 2. It would be out in most cinemas next week. I was inspired to do a movie-themed nail art so I decided to try out a minion nail art. The nail colors used are from the summer collection by Etude House. The bright yellow tone is a great perky color for the warm weather! Step-by-step details in the post below! Above is a close up of a close-up shot of the two main colors. The blue and yellow goes very well with each other and the contrast is a great pop of color! The rough sand texture also offers a nice contrast with the glossy yellow polish. 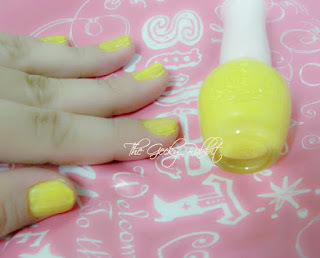 Step 1: Apply base coat, followed by 1 or 2 coats of yellow polish. 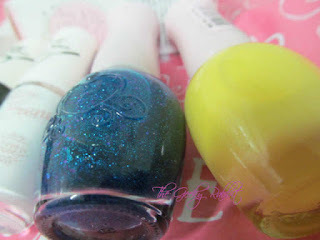 The Dear My Nails in BE101 is pigmented enough for 1 coat, but 2 coats will work too. Let the polish dry completely before the next step! 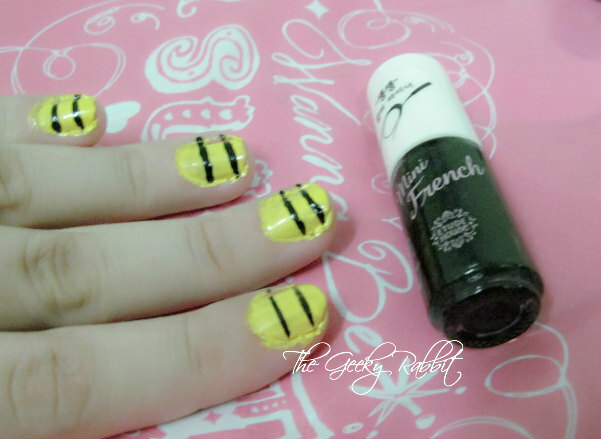 Step 2: Paint 2 stripes across the nail using the black Mini French polish. The thin brush allows great precision. The stripes will divide the nail into approximately equal sections. 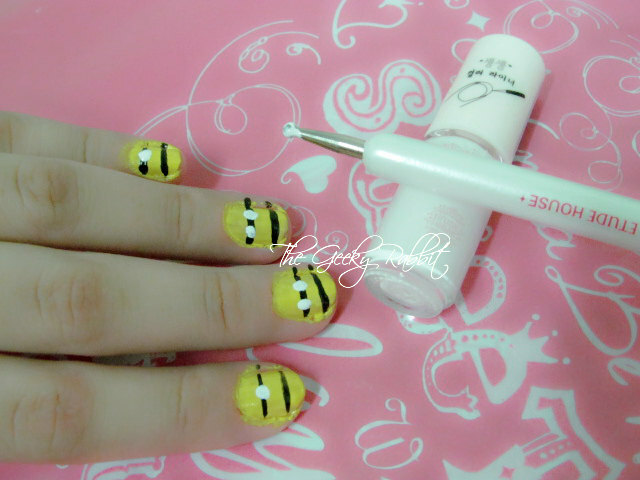 Step 3: Using the nail dotter, dot 1 or 2 dots on each nail. I did 2 nails with 1 dot and 2 nails with 2 dots. The white dots will be on the black stripe closer to the cuticle, to represent the eyes! Step 4: Using the same black Mini French, paint on the mouth and iris of the eyes. At this point, wait for the nails to dry and add 1 coat of topcoat. This step is optional. Step 5: Paint on the blue polish for the tips! This will be the last step. No top coat to be used here, so that the sand texture of the polish will be preserved. This is a very cheerful manicure, and can be pretty quick too. I did the entire manicure in about 30 minutes. 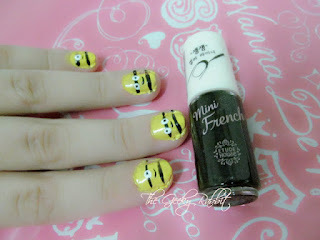 The Etude House Dear My Nails and Mini French dry pretty quickly, so each step takes less than 5 minutes to set. The pigmented colors pop out and are very striking! 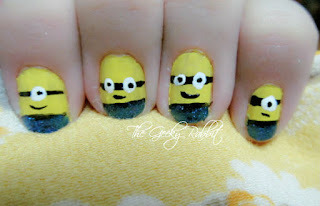 I love this nail art and looking at my nails bring a smile to my face. As I mentioned in the earlier post on the summer nail polishes here, the most interesting polish of the lot was the Summer Sand collection. In this tutorial, I've tried out the colors and they definitely is something very different from the usual glossy polish. The texture is slightly 'sandy and rough, so there's a very unique contrast to the glossy polish. 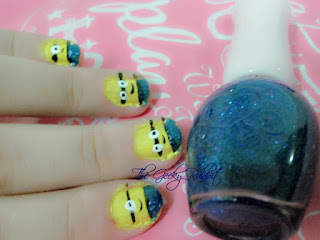 It gives the overalls of the minions a very realistic feel! I will be posting a separate review of the Summer Sand collection next week !